Of the 1.55 lakh aspirants who appeared for the JEE, 18,138 students cleared the cut-off, which is 1.6 times the number of seats on offer, according to IIT-Kanpur. In 2017, more than 51,000 students had cleared the examination. Despite the sharp fall in successful candidates, the IITs are confident of filling up 11,279 seats on offer. As results of the Joint Entrance Examination (JEE) Advanced were announced Sunday, the number of candidates who cleared the test this year for admission to the IITs is the lowest in seven years. IIT-Kanpur, which organised the JEE-Advanced, attributed the dip in the number of all-India rank holders to an error-free question paper, which negated the need for grace marks. Since 2013, when IIT-JEE was renamed JEE-Advanced and the eligibility criteria for the entrance test was tweaked, the number of candidates who qualified has always been at least twice the total seats on offer. Despite the sharp fall in successful candidates, the IITs are confident of filling up 11,279 seats on offer. “Last year, though 51,000 candidates made the cut, the last rank at which a seat was allotted was less than 14,000. 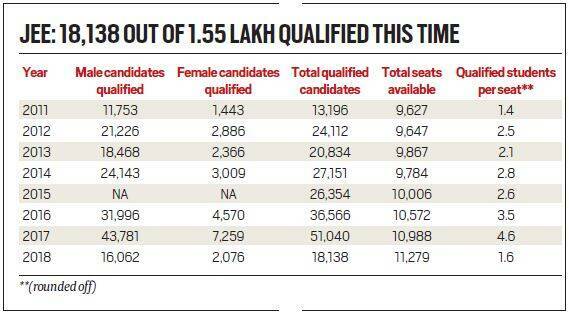 So, with over 18,000 candidates, filling up seats should not be a problem even this year,” said Professor Aditya Mittal, chairman of JEE-Advanced at IIT-Delhi. JEE-Advanced is the gateway to securing admission to any one of the 23 IITs. To appear for this test, an aspirant has to first qualify JEE (Main) and figure in the top two lakh candidates. Those who qualify JEE (Advanced), but do not find a seat in the engineering branch of their choice at an IIT, usually opt for National Institutes of Technology (NITs), which admit students based on all-India ranks of JEE (Main). Professor Shalabh of IIT-Kanpur told The Indian Express that the 18,138 qualified aspirants are an ideal number for counselling. He attributed the dip in the number of all-India rank holders to the entrance test being free of glitches this time. “The JEE-Advanced this year was completely free of errors, which is why no grace marks were awarded. Grace marks end up pushing in more aspirants into the qualifying list,” said Shalabh, who as IIT-Kanpur’s JEE-Advanced chairman organised the entrance test this year. In 2017, organising institute IIT-Madras had awarded 18 bonus marks to all candidates on account of errors in the question paper. As a result, 51,040 qualified the exam, the highest ever. According to Mittal, all the successful aspirants this year cleared the exam without any dilution on the merit front. “Apart from the entrance test being error-free, fortunately, there was no need to lower the cut-off marks any further (from what was initially announced) for students. Everyone on the list has scored above the pre-decided cut-off (126 marks for general, 114 for OBC, 63 for SC/ST) and that is a very good sign, merit wise,” he said. In 2015, IIT-Mumbai had to lower the bar after evaluation as an adequate number of aspirants failed to make the cut. This year, about 30 per cent (approximately 65,000) of those who made the cut in JEE (Main), to appear for JEE-Advanced, did not register to cross the second barrier to joining IITs. This year, the IITs introduced 800 supernumerary seats exclusively for women to improve the gender ratio on campus. The number of female candidates (2,076) who have made the cut this year is also the lowest in seven years. According to Dheeraj Sanghi, professor of computer engineering at IIT Kanpur, the institutes may face problems filling up seats for women. “The IITs are aiming to increase the strength of their female students to 14 per cent of the student population this year. A pool of 2,000 women may not be enough to achieve that,” he said. Out of the 18,138 who qualified JEE Advanced, 8,794 are general candidates, 3,140 are from the OBC category, 4,709 are Scheduled Castes and 1,495 are Scheduled Tribes. The highest number of aspirants have qualified from IIT Delhi zone (5,072), followed by Madras (3,595) and Bombay (2,936) zones. Pranav Goyal from the Panchkula region, who scored 337 out of 360, topped the examination while Sahil Jain from Kota and Kalash Gupta from Delhi followed at ranks 2 and 3. Meenal Parakh is the female topper and stood sixth, overall scoring 318 out of 360. Despite efforts to attract more foreign students, this time only three cleared the exam. Since 2017, IITs have been conducting JEE-Advanced at five international centres to woo foreign students. Last year, seven had qualified, of which three finally took admission in IIT Delhi, IIT(BHU) and IIT Bhilai.